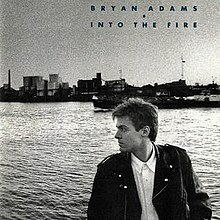 The recording for Into the Fire started on 16 August 1986 and finished on 24 October. It was recorded at a studio set up in Adams' house. Adams and his backing band, which consisted of Keith Scott, Mickey Curry, Dave Taylor and Tommy Mandel, used the dining room, bathroom and bedroom to isolate the different instruments. The studio was named Cliffhanger since Adams' house was close to the sea. "Heat of the Night" was recorded 12 September 1986. "Hearts on Fire" was originally written for Reckless in 1984 but was recorded on 1 September 1986. "Hearts on Fire" was mixed in London, England on 11 January. By the time Into the Fire was completed, there were only two songs Adams and Vallance were satisfied with: the dark "Victim of Love", and the upbeat "Hearts on Fire", which was written during the Reckless recording sessions, two years earlier. A possible influence to the album was Adams' involvement of the six-city "Amnesty International Conspiracy of Hope" tour in 1986. Adams says in the "Into the Fire" songbook that the album's title track refers to a man who is at a crossroads and does not quite know what to do with his life, which is how Adams felt when he started recording the album after the massive success of Reckless. As Adams said to Rolling Stone Magazine, "We wanted to make a record with more lyrical depth". Where Adams had previously used guitar amps, they would instead employ the latest in "sampling". The song "Into the Fire" was recorded in 1986 at "Cliffhanger", Adams' home studio in West Vancouver. At the recording session Adams and Bob Clearmountain had problems with the guitar sound. On the demo for "Into the Fire" Adams and Vallance used a Rockman pocket amplifier. The album was released on 30 March 1987 and featured the singles "Heat of the Night" and "Hearts on Fire". Though commercially successful, peaking at number seven on the Billboard 200, the expectations for Into The Fire were set by the overwhelming success of Adams' previous number one hit album Reckless. That album had sold over 12 million; in that context Into the Fire, which sold over 2 million copies worldwide at its time of release, was viewed as a commercial failure. "I have to laugh when the press say that LP didn't do well because it did as well as Cuts Like a Knife, but I suppose the perception was it wasn't Reckless II! Who cares? There were some songs that were slightly different than what we had written before ... some were, let's say, slightly more exploratory than we'd written in the past. Vallance was up for the songwriting challenge of not repeating Reckless." Critical reception was generally unfavourable, with the album's lyrics being particularly singled out as substandard. Robert Christgau knocked Into The Fire for its "dumbness density", noting that he counted "an astonishing fifty-six full-fledged clichés on what's supposed to be a significance move." "Adams shows that he has a will to speak but nothing in particular to say....a scan of the song titles ("Heat of the Night," "Only the Strong Survive," "Into the Fire" and so on) shows that the best Adams and co-writer Jim Vallance could come up with was a series of clichés. ... Worse are the vague pro-Native American message of "Native Son" and the antiwar message of "Remembrance Day," the lyrics of which read like earnest but clumsy high-school poetry. A retrospective review from Eduardo Rivera at AllMusic characterized most of the album's songs as "lifeless and dull", with some even being called "depressing", "ugly" or "truly awful". Only "Hearts on Fire" met with Rivera's critical approval. "Heat of the Night" was the debut single from Into the Fire and was released worldwide in March 1987. In the US, The song reached peaked at number 2 on the US Billboard Mainstream Rock Tracks chart and at number 6 on the Billboard Hot 100. "Heat of the Night" reached number 7 on the Canadian singles chart and remained in the top ten for five weeks. In Canada, the compact disc release became the first by a Canadian artist to earn a Gold certification (sales of 50,000 units), and only the second overall following Brothers in Arms by Dire Straits. "Heat of the Night" was released the following month in the UK and peaked in the top 50 on the UK Singles Chart at 50, and became Adams' only single from Into the Fire to chart in mainland Europe. "Heat of the Night" was eventually nominated for a Canadian Juno Award for Single of the Year in 1987. "Hearts on Fire" was the second single from Into the Fire. The song become a minor hit at its time of release. The song peaked at number 26 on the Hot 100 chart and at number 3 on the Mainstream Rock Tracks chart while reaching number 25 in Canada. "Victim of Love" and "Only the Strong Survive" would be the two follow-up singles to "Hearts on Fire". These singles became minor hits with "Victim of Love" reaching number 10 on the Mainstream Rock Tracks chart, number 32 on the Hot 100 and number 49 on the Canadian Singles chart. "Only the Strong Survive" reached number 47 in Canada. "Another Day", which was released as the B-side to "In the Heat of Night", peaked at number 33 on the Mainstream Rock Tracks chart. The title track also received airplay on American album-oriented rock radio stations and reached number 6 on the Mainstream Rock Tracks chart. In May 1987, Adams started the Into the Fire tour where his first performance was in Shreveport, Louisiana with his backing band. Adams first stop of the UK leg of the tour at the Prince's Trust charity concert at Wembley Stadium, London. Adams would later head back to the United States to continue the American leg of the tour, Adams appeared on Late Night with David Letterman. Adams would later sell out two nights in a row at Madison Square Garden in New York City and was visited backstage by Brian Wilson of The Beach Boys, he would later get a sold out show in Toronto, Ontario. The tour continued through the Western United States. Adams heads back to the UK on October 13 in Newcastle, England. Adams sold out four nights in a row at Wembley Arena in London. Adams starts his tour in mainland Europe and Adams previous album Reckless achieves gold status in Sweden and Into The Fire achieves gold status in Switzerland and later he travels to Dublin, Ireland. Adams started the Asian leg of the tour and ended up selling out ten concerts, five of which were in Tokyo's Budokan. Into the Fire ends up being certified platinum with sales over 100,000 copies sold in Japan. Adams headed back to Europe and played in East Berlin and later West Berlin. The last concert part of the Into the Fire tour was played in Locarno, Switzerland. All tracks written by Bryan Adams and Jim Vallance. Robbie King – organ on "Heat of the Night", "Another Day", "Only the Strong Survive" and "Rebel"
Dave "Pick" Pickell – piano on "Victim of Love", "Only the Strong Survive" and "Rebel"
Ian Stanley – keyboards on "Victim of Love" and "Remembrance Day"
^ a b Rivadavia, Eduardo (2011-04-03). "Into the Fire Review". AllMusic. Retrieved 2018-02-13. ^ WILLMAN, CHRIS (1987-04-05). "Bryan Adams Grows Up". Los Angeles Times. ISSN 0458-3035. Retrieved 2018-02-13. ^ a b Christgau, Robert (June 2, 1987). "Into the Fire". The Village Voice. New York. Retrieved 2012-08-11. ^ Uricchio, Marylynn (1987-04-24). "Variety would spice up Adams' 'Into the Fire'". Pittsburgh Post-Gazette. p. 27. Retrieved 2018-02-13. ^ a b Hochman, Steve (1987-05-21). "Bryan Adams: Into The Fire". Rolling Stone. ^ Brackett, Nathan; Christian Hoard (2004). The Rolling Stone Album Guide. New York City, New York: Simon and Schuster. p. 6. ISBN 0-7432-0169-8. ^ a b c d e "Billboard 200". Billboard.com. Retrieved 2008-06-24. ^ a b c d e f g h i j k "The Life Of Bryan" (in Danish). -skolarbete.nu. Retrieved 2008-06-24. ^ a b c d e f "Anthology". 2005-10-18. ^ a b c d e f g " "Into the Fire". JimVallance.com. Archived from the original on 2011-07-13. Retrieved 2008-10-07. ^ a b "British Album Chart". Chart Stats. Archived from the original on 2008-09-13. Retrieved 2008-06-24. ^ a b "Norwegian Chart". norwegiancharts.com. Archived from the original on 2011-07-21. Retrieved 2008-06-24. ^ a b "Swedish Chart". swedishcharts.com. Archived from the original on 2010-01-17. Retrieved 2008-06-24. ^ a b "German Chart". Charts-Surfer. Archived from the original on February 2, 2009. Retrieved 2008-06-24. ^ a b "Austrian Chart". austriancharts.at. Retrieved 2008-06-24. ^ a b "Canadian Chart". RPM. Retrieved 2008-06-24. ^ "CRIA Certifications". CRIA. Archived from the original on 2008-10-06. Retrieved 2008-06-24. ^ "BPI Certifications". BPI. Retrieved 2008-03-07. ^ "Swiss Chart". Die Offizielle Schweizer Hitparade. Archived from the original on 2009-06-15. Retrieved 2008-06-24. ^ "Swiss Certifications". Swiss Hitparade. Archived from the original on 2009-01-29. Retrieved 2008-03-07. ^ "RIAA Certifications". Recording Industry Association of America. Archived from the original on 2013-08-08. Retrieved 2008-06-24.